Picture yourself at the end of the nineteenth century in France. The Bohemian movement is in full swing. Revolutions in art and literature are brewing, technology is advancing rapidly, and more and more people are putting their creative efforts into the expansion of culture. You walk into a Paris café and see someone sitting at a corner table, scribbling or sketching madly, eyes fiery with enthusiasm. More than likely you see on the same table a glass containing a cloudy liquid—absinthe, the legendary “green muse” to which many artists of the day attribute their creative insights. What you are drinking is a spirit made by distilling herbs. But that could describe many drinks; what makes absinthe special is the presence of a particular herb—Artemisia absinthium, commonly known as wormwood. This concoction was invented in 1792 by a French doctor named Pierre Ordinaire. While living in Switzerland, Ordinaire was trying to create a patent medicine to cure stomach ailments. He tried wormwood in one of his recipes—along with anise and a variety of other herbs—and found it very successful. Eventually the formula became commercialized, and absinthe began to shift from an over-the-counter remedy to a refreshing drink, acquiring the nickname “the Green Fairy.” Absinthe has a high alcohol content—nearly 70%—and a slightly bitter flavor. Adding water and sugar before drinking it worked wonders in improving its mass appeal. Unlike other alcoholic beverages, which have a sedative effect, absinthe was reputed to provide exceptional clarity of thought. Artists relied on it for inspiration and imagery. Among those who swore by absinthe were Van Gogh, Degas, Toulouse-Lautrec, Picasso, Hemingway, and Edgar Allen Poe. Oscar Wilde was a fan too, and was famously quoted as saying: “After the first glass, you see things as you wish they were. After the second, you see things as they are not. Finally you see things as they really are, and that is the most horrible thing in the world.” Behind this wry commentary, though, was a troubling implication. An increasing number of people became convinced that absinthe was not a benign stimulant but a dangerous drug. Among those who drank absinthe excessively, there were numerous reports of hallucinations, convulsions, and even insanity. In 1905, public anxiety came to a head when a Swiss farmer named Jean Lanfray shot his whole family. The newspapers were quick to point out that Lanfray had been drinking absinthe, not bothering to mention that he had also consumed a great deal of wine and other spirits that day. This was the final straw for those who vilified absinthe, and political pressure to rid society of this evil quickly mounted. 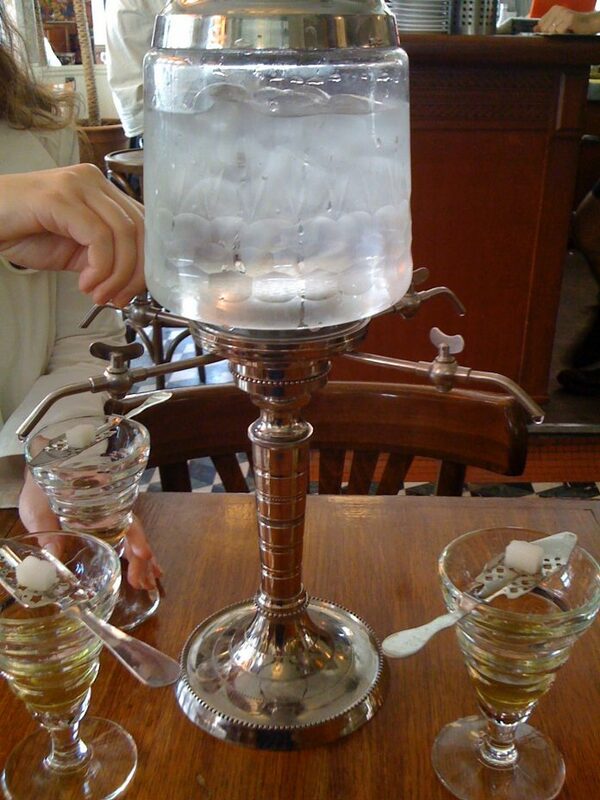 In the years that followed, absinthe was banned in most parts of Europe, as well as in the United States. The deleterious effects of absinthe were typically attributed to a substance called thujone, a component of wormwood. Nowadays, scientists believe there’s little or no truth to the notion that it is a dangerous drug. Every modern study of thujone suggests that the amount required to harm human beings is many times that found in even the strongest brands of absinthe from a century ago. In fact, to ingest enough thujone to do any damage, you’d have to drink so much absinthe that you’d have died—or nearly so—from alcohol poisoning. Thus one common explanation for the disturbing behavior witnessed in absinthe drinkers is that they were simply drunk—a problem, for sure, but not one unique to absinthe. However, a more interesting explanation is based on evidence that unscrupulous absinthe producers in the nineteenth century, in an effort to lower their costs, added a variety of toxic chemicals to their absinthe—such as a copper compound used to provide a green color. The effect of these toxins—added to that of the alcohol itself—is a more plausible cause of the legendary absinthe madness. All over the world, absinthe is enjoying a comeback, as many of the old laws prohibiting its manufacture and sale have been revised or at least reinterpreted. There have been two main legal sticking points over the years: thujone content and labeling. The United States has a rule requiring thujone levels in beverages of this sort to be less than 10 parts per million (ppm), while in the European Union, which formerly observed the same rule, the acceptable level is now 35 ppm. (The U.S. Food and Drug Administration actually calls any beverage meeting the 10 ppm test “thujone-free.”) But that’s more or less a moot point, because most brands of absinthe sold in the 19th century were already within this limit—not that it matters much anyway, given the research that shows the thujone wasn’t the problem in the first place. A bigger issue is that regulatory agencies in some countries (including the United States) still don’t want anyone selling something that’s called absinthe, even if that’s precisely what it is, largely because of a perception that this word connotes a drug of some sort. So absinthe distillers have reached compromises with various government agencies such as using the word absinthe only as part of a phrase, or in smaller type, or otherwise adjusting the label to make it sound less like you’re going to be drinking something that’s likely to make you hallucinate. Canada, meanwhile, never bothered to restrict the sale of absinthe because it was never perceived to be a social or political problem there. I had my first encounter with the Green Fairy while I was living in Canada several years ago, when absinthe was still unavailable in the United States. I experienced a subtle, but noticeable, increase in the clarity and vividness of my thoughts shortly after drinking absinthe—a much different effect than I’d have expected from alcohol alone. Then again, I couldn’t say with complete certainty that the effect was not imagined, and there was an additional complication: the uncertain authenticity of the formula. I lived in France from 2007–2012, and it so happened that I moved there right around the time legal absinthes were starting to appear in the United States. It’s easy to find bars in Paris with wide selections of absinthe on the shelves, and I had the pleasure of sampling quite a few varieties of authentic absinthe in France—including some that are still unavailable in North America. To be honest, although I’ve enjoyed every absinthe I’ve tried, my unsophisticated palate sometimes has difficulty differentiating the taste of absinthe from that of pastis, a similar (but wormwood-free) anise-based distilled beverage that rose to popularity when absinthe was banned. (During the time when absinthe was legally unavailable, numerous companies began producing pastis with names suggestive of absinthe—brands like Absente, Versinthe, and La Muse Verte.) I can’t say the absinthe I’ve had here has made me more creative or clear-headed, but perhaps I simply haven’t been diligent enough in my experimentation. I’ll press on. Note: This is an updated version of an article that originally appeared on Interesting Thing of the Day on April 15, 2003, again in a slightly revised form on July 12, 2004, and with yet another revision on April 30, 2008.